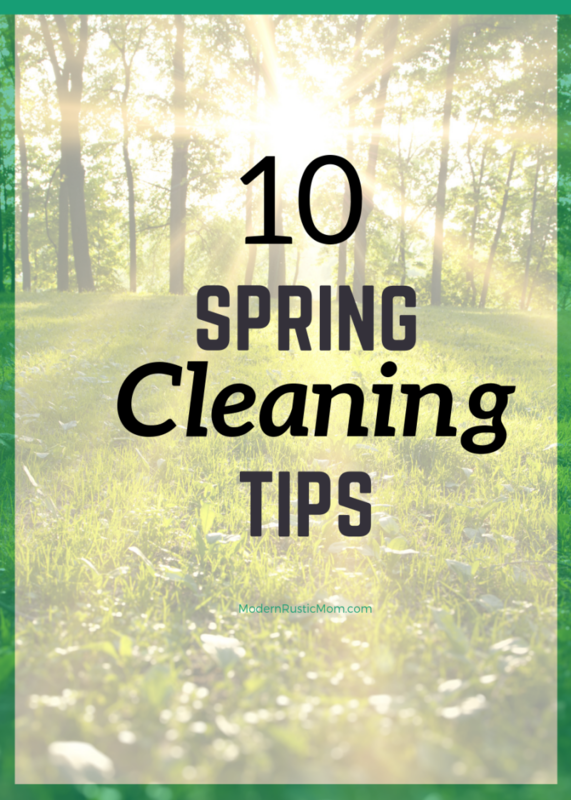 When you start thinking about spring cleaning, what do you think about? I think about opening windows, shaking out the dust, and breathing fresh air. In truth, spring clean is a large project, almost above and beyond the normal call of duty. Instead of a chore, though, it’s great to think of it as an opportunity to freshen your home. It’s a chance to use the longer spring afternoons to tackle some projects around the house that have been nagging you all winter. It’s a chance to get rid of things you no longer need and start fresh. Frankly, it’s a good opportunity to shake out the winter doldrums and usher in the new season. Do trips on their own day i.e. laundromat and dropping off recyclables/donations. Use this as a trip for yourself to go get a nice cup of coffee and read your book or favorite magazine. 3. Do it on a warm day that you can open windows. This is super important if you’re using cleaning products like bleach or even tile cleaner. I try to use more https://amzn.to/2XiQ0Vm where possible. 4. Get cleaning supplies and equipment ahead of time. There is nothing worse when you go to start a project when you need a certain tool or product and you don’t have it. It not only makes the job harder but takes a whack at your motivation. Heavy duty garbage bags. Even if you are super-conscious about recycling and donating, chances are you’ll still have some items that need to be discarded. The heavy duty bags will hold up to sharper edges or heavier-duty items. Old boxes to put in heavy items such as magazines for recycling or toys for donation. Diaper boxes are the perfect size. Dusting rags. As family socks become a little ragged or your dish towels are too embarrassingly stained to leave out, put them in a designated box in your mud room/cleaning closet/basement. That way you can use those instead of rolls and rolls of paper towels (see #7). Try Amazon Home Services ? 6. Schedule your cleaning about a week or two before company comes. This way, you’ll have a clean house and you won’t be exhausted when they arrive. 7. Don’t do it all in one day. If you can do it in one day, then make sure you get a nap in the next day. 8. Use reusable cleaning supplies to reduce waste. So instead of paper towels dry cleaning cloths, washable microfiber towels instead of disposable Swiffer cloths, and use old toothbrushes instead of new scrubbers. 9. Don’t just clean, institute new systems. I have a confession to make. I have a love-hate relationship with my kitchen counter. For the longest time, the small strip of counter near the mudroom became a repository for everything. It wasn’t a problem of the things needing to be thrown out. It was a problem of habit. So, I instituted new systems to eliminate (or at least reduce the proble m). 10. Make a play list of songs or podcasts. Hey, might as well catch up on the latest releases! Headphones optional. Fun dance moves required. 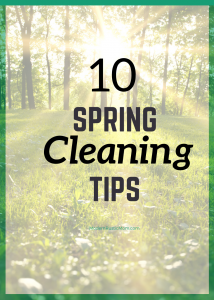 Focus the cleaning on areas that are most important to your health and sanity. Cleaning isn’t about being able to eat off of any surface in your home (at least not in my home!). It’s to keep you and your family safe, organized, and happy. If you have limited time, focus on the tasks that try you the craziest (like not finding any clean clothes or a cluttered kitchen counter). Great tips! I have a serious problem going from task to task and never getting anything done.